What does the Africa Cup mean for Africa’s cycling development? Noha Soliman: Long ago, CAC put numerous strategies in place to hold regular competitions, like the African Championships and Africa Games. These were for all the cycling disciplines. Since 2013, we have had competitions held annually for road, track, BMX, and mountain bike races. The creation of the Africa Cup is an extension of those strategies we had put in place. The event, as I have mentioned, is established by CAC and is registered on the UCI calendar. This competition will give more chances to African riders to compete more at the national level. They will have a chance to score points to increase their international ranking and be able to qualify for the Olympic Games. Isabella Fernandes. I think it is good to have a little bit of competition where we can have several national teams from across Africa compete in championships and cups. This is very good for the development of cycling in Africa and the exchange of experiences between participating nations. Hosting competitions such as this within the continent will definitely give African cycling the exposure it needs. For instance, the competing cyclists were going at an average speed of 51 km/hour on the first stage of the team time trails on Wednesday, which I might say is quite exceptional and reflects how talented African riders are. When others see this, they surely will grasp the picture that African cycling is developing. Mohamed Bashir: The first two stages of the competition were very impressive and highly competitive. I am not surprised to see Eritrea already doing well. It is clearly evident that cycling is a part of everyday life for Eritreans. I was here once in 1983 as a cyclist. Today, I am happy to be back as one of the officials overseeing the competition. Noha Soliman: It was very good. It is great to see the participating nations doing their best to win the races. You can see it on the faces of riders just how much this means to them. The Federation and Commission of Sports and Culture have done an impeccable job in making everything run smooth during the last two days. Isabella Fernandes. As commissioners of the race, we are urged to have a balanced outlook about how the competition is progressing. It is our responsibility to follow guidelines. We still have two stages to go and I think it is better if we evaluate everything after the end of the competition. But so far everything is going well. Noha Soliman: This competition will help the growth of cycling in Africa. I would like to extend my heartfelt appreciation to Eritrea for hosting the first edition of the Africa Cup. It is a great achievement for the country and CAC. Benin is here participating and the team from the Seychelles will compete in today’s competition, as well as in the final stage of the competition, which will be held tomorrow morning. I w o u l d like to thank the organizers and the Commission of Sports and Culture for making this competition a reality. 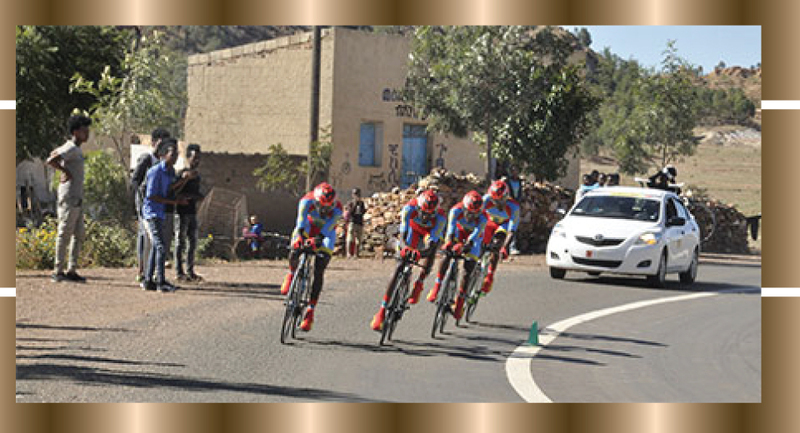 Mohamed Bashir: I would like to praise and thank the Government of Eritrea, Eritrea’s Cycling Federation, the Commission of Sports and Culture, the Organizing Committee, the security personnel, and the people of Eritrea for hosting the first edition of the Africa Cup. Noha Soliman: Thank you Eritrea! Isabella Fernandes: Let’s continue to enjoy the races. I invite everyone to come out and support the riders during the next two stages of the competition.